in a laid-back autumn vibe with earth tones and romantic sweeping lashes. 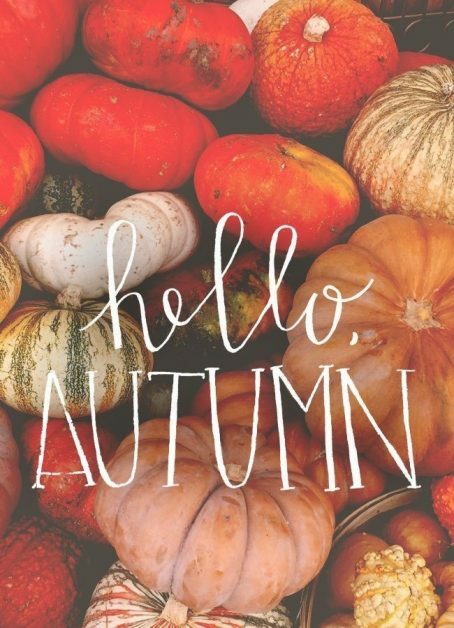 Fall is an amazing season here in Austin; the days are scorching hot, the leaves begin to fall in Zilker and along the Town Lake trail, and all over town restaurants and coffee shops come out with their pumpkin and Thanksgiving themed treats. 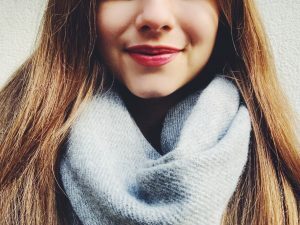 Fall also provides a great transition for our skin into winter, and calls for a change of look from the brighter summer colors and sweat-combatting skincare routine. The weather is going to start to get cooler – and slightly less humid – so now is not the time to skip out on your moisturizing primer. Skin always takes a bit of time to adjust when the seasons change, give it a smooth transition by making sure it’s protected. 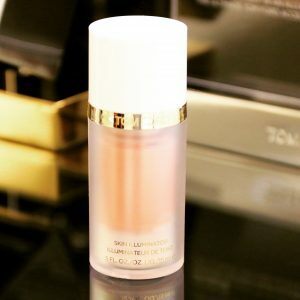 We love subbing tinted moisturizers for primer, since they carry the added benefits of hydration plus a little coverage, so you don’t have to layer on the base. Unless you spent all summer indoors, you probably have a lovely little tan and some color in your cheeks. Keep it alive by dusting on a touch of bronzer to your cheeks, forehead and chin (right where the sun would hit). 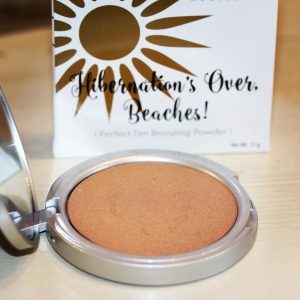 No need to use blush, the bronzer should add enough color by itself when applied like this. Pro Tip: Sweep bronzer under your chin to minimize the appearance of a double chin. Fall is always a time to celebrate the natural change of colors in the world around us, so autumn trends usually lean more towards colors that mimic the leaves; light browns, sienna and burnt creams are particular favorites for eye colors. Use sparingly! We want your lashes to be the stars. Apply your chosen color over the entire eyelid, up to the brow, then smooth out with your primer brush to blend. 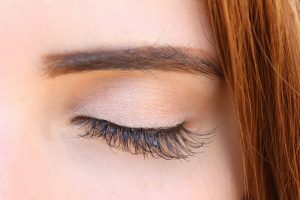 There’s no better time than fall for romantic walks around Austin to see the seasons changing, and there’s nothing more romantic than long, fluttering lashes. We love adding a little extra to your natural lashes by using strip lashes. They’re the easiest and most fool-proof in our experience when applying at home! You want to make sure you measure the strip and trim it to fit your natural lash range. Once trimmed, make sure you move them around (think of them like a slinky) until they are flexible. Curl your lashes with a few pulses of your curler, just to lift and open the lashes up. Prime your lashes with your favorite mascara, going back and forth across the lashes until they are fanned out. Use your finger or a Q-tip to buff out any clumps. If the lashes you chose are not self-adhesive, prep your glue on either your hand or a clean flat surface (sometimes we use business cards!). For both types, use tweezers to apply the false lashes right at the lashline, starting in the center and moving out. Press down with the blunt side of the tweezers (the handle), and flip your natural lashes up so they blend with the false ones. 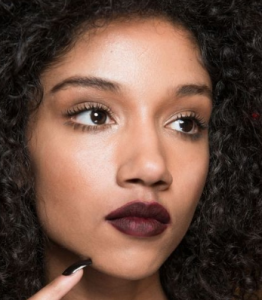 For your lips, we love deep colors with purple or blue undertones like berry and pinot. Mattes are the best, since the color itself makes a statement. Once you apply your favorite color, use a finger tips to soften over your entire lip and lipline, giving a smudgy, unkempt look. Fall is not a time for pristine! 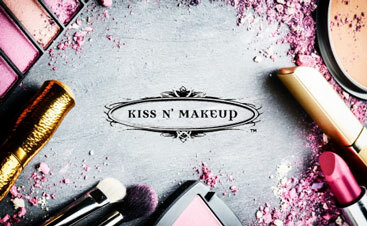 From everyone at Kiss N’ Makeup, we hop your Fall is filled with leaf-strewn walks, hot coffee and lazy days.